Throughout Earth's 4.5-billion-year history, the heat at its core has rearranged the surface over and over. The crust, the surface layer of the planet, has been compressed, pulled apart, raised, and lowered. The force of these various movements has fractured the crust, breaking it into sections. The sections have slammed into each other, slid under each other, or scraped by each other. As a result, great mountain ranges have been raised and great valleys and trenches have been lowered. Not all landforms created by the constant movement of the crust are as dramatic as these. Some are merely bumps and dips in a landscape that rises and falls. Basins are such landforms. Created by heat forces beneath the surface and weathering forces above it, basins are part of distinctive landscapes found worldwide. A simple definition of a basin is a hollow or depression in Earth's surface with no outlet for water. This means that any water that originates in or flows into a basin does not escape it. A basin can be approximately circular, resembling a bowl, or it can be oval-shaped. It can be a small structure, measuring only a few miles in diameter. Often, it is much larger. A basin is usually surrounded mostly by higher land. Depending on where it is located, a basin may sometimes include desert areas, which are arid or dry regions receiving less than 10 inches (25 centimeters) of rain per year. Given its shape and the fact that it has no surface outlet, a basin collects what flows into it. This is especially true of the products of erosion, which is the gradual wearing away of Earth surfaces through the action of wind and water. 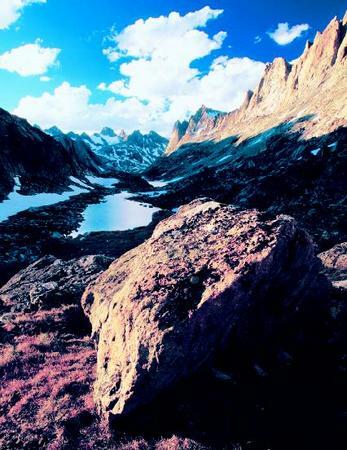 When water that falls as rain or snow washes over the surface of the higher land surrounding a basin, it strips away sediment—gravel, clay, sand, silt, various salts, and other rock particles. As this water then flows into the basin, it carries along this sediment. Collecting in low-lying areas of the basin, the water either quickly evaporates, sinks into the ground, or forms lakes and marshes. The bottoms of these water-filled areas are lined with this sediment. Often, these lakes eventually evaporate. What is left behind is a dry, flat, salt-encrusted, cracked surface known as a playa (pronounced PLY-uh). Over thousands to millions of years, sediment may collect in a basin to a depth of 1 mile (1.6 kilometers) or more. Because of this, basins are also often known as sedimentary basins. Basins are created in one of two ways. In both, land downwarps or sinks. This lowering of the land surface is brought about by the movement of the sections of the crust, known as plates, and by the way rock deforms or changes shape in response to that movement. The scientific theory explaining the movement and interaction of the plates is known as plate tectonics. (A theory is a principle supported by extensive scientific evidence and testing.) Geologists developed this theory in the early 1960s. A revolutionary idea, it transformed our understanding of Earth. It helped explain how landforms and other geologic features are created and how Earth's surface changes over time. Although Earth appears to be made up of solid rock, it is actually made up of three distinct layers: the crust, the mantle, and the core. Each layer has its own unique properties and composition. As mentioned earlier, the crust is the thin shell of rock that covers Earth. It is separated into two types: continental crust (which underlies the continents) and oceanic crust (which underlies the oceans). It varies in thickness from 3 to 31 miles (5 to 50 kilometers). The crust is thickest below land and thinnest below the oceans. The layer below the crust is the mantle, which extends down approximately 1,800 miles (2,900 kilometers) below the surface of the planet. The mantle is denser than the crust because it contains more of the elements iron and magnesium. It is separated into two layers: The uppermost part of the mantle is solid and, along with the overlying crust, forms the lithosphere (pronounced LITH-uh-sfeer). Measuring about 60 miles (100 kilometers) thick, the lithosphere is brittle. It is the lithosphere that has broken into the thick, moving slabs of rock known as tectonic plates. The part of the mantle immediately beneath the lithosphere is known as the asthenosphere (pronounced as-THEN-uh-sfeer). The greater the depth beneath Earth's surface, the greater the temperature and pressure. As rock is heated, it becomes pliable or what geologists call "plastic." Rock in the asthenosphere is hot enough to fold, stretch, compress, and flow very slowly without fracturing. It is puttylike in its consistency. The rigid tectonic plates "float" on the more dense, flowing asthenosphere. At the center of the planet lies the core, composed of a liquid outer layer and a solid inner layer. Unlike the rocky layers above it, the core is made up of the metallic elements iron and nickel. It is almost five times as dense as rock on Earth's surface. Temperatures in the core are estimated to exceed 9,900°F (5,482°C), creating extreme heat energy. The heat energy generated at Earth's core moves the tectonic plates across the planet's surface. This energy is carried to the area beneath the plates by convection currents, which act similar to the currents produced in a pot of boiling liquid on a hot stove. When a liquid in a pot begins to boil, it turns over and over. The liquid heated at the bottom of the pot rises to the surface because heating has caused it to expand and become less dense (lighter). Once at the surface, the heated liquid cools and becomes dense once more. It then sinks back down to the bottom to become reheated. This continuous motion of heated material rising, cooling, and sinking forms the circular currents known as convection currents. Like an enormous stove or furnace, the core heats the mantle rock that immediately surrounds it. Expanding and becoming less dense, the heated rock slowly rises through cooler, denser mantle rock above it. When it reaches the lithosphere, the heated rock moves along the base of the lithosphere, exerting dragging forces on the tectonic plates. This causes the plates to move. In the process, the heated rock begins to lose heat. Cooling and becoming denser, the rock then sinks back toward the core, where it will be heated once more. Scientists estimate that it takes 200 million years for heated mantle rock to make the circular trip from the core to the lithosphere and back again. Tectonic plates are in constant contact with each other, fitting together like pieces in a giant jigsaw puzzle. No single plate can move without affecting one or more other plates. Generally, a plate inches its way across the surface of Earth at a rate no faster than human fingernails grow, which is roughly 2 inches (5 centimeters) per year. As it moves, a plate can transform or slide along another, converge or move into another, or diverge or move away from another. The boundaries where plates meet and interact are known as plate margins. The movement of a tectonic plate can create stress (force acting on an object) anywhere within the plate. In response to stress, rock will change its shape or volume or both. This change is known as strain. There are three main types of stress that cause rock to change: Tension pulls rock, causing it to stretch. The ends of the rock become thicker while the middle becomes thinner. Compression squeezes rock, causing it to become denser and take up less space (more matter in a smaller volume). Shearing pushes rock in two opposite directions. This usually results in a simple bend or break. An upward-curving (convex) fold in rock that resembles an arch. The section of the mantle immediately beneath the lithosphere that is composed of partially melted rock. The circular movement of a gas or liquid between hot and cold areas. The thin, solid outermost layer of Earth. The gradual wearing away of Earth surfaces through the action of wind and water. A crack or fracture in Earth's crust along which rock on one side has moved relative to rock on the other. The area where crustal blocks meet and move along a fault from the fault line down into the crust. A bend or warp in a layered rock. A block of Earth's crust dropped downward between faults. A block of Earth's crust forced upward between faults. The rigid uppermost section of the mantle combined with the crust. The thick, dense layer of rock that lies beneath Earth's crust. Large sections of Earth's lithosphere separated by deep fault zones. The geologic theory that Earth's crust is composed of rigid plates that "float" toward or away from each other, either directly or indirectly, shifting continents, forming mountains and new ocean crust, and stimulating volcanic eruptions. A shallow, short-lived lake that forms where water drains into a basin and quickly evaporates, leaving a flat surface of clay, silt, and minerals. The change in a rock's shape or volume (or both) in response to stress. The force acting on an object (per unit of area). A downward-curving (concave) fold in rock that resembles a trough. Folds are formed by tectonic forces that act to compress Earth's crust. A downward-curving fold that resembles a trough is called a syncline. An upward-curving fold that resembles an arch is called an anticline. Tectonic forces that act to compress Earth's crust form folds. A fold may be a broad, gentle warping over many hundreds of miles or a small flex over just a few inches. An upward-curving fold that resembles an arch is called an anticline (pronounced AN-ti-kline). A downward-curving fold that resembles a trough is called a syncline (pronounced SIN-kline). Anticlines and synclines often occur together in sets, similar to the upand-down folds created in a carpet when its ends are pushed together. A basin created by folding is a large, synclinelike fold in which all sides dip toward the center. Basins formed in this manner are subject to the dueling forces of plate tectonics and erosion. Once formed, the basin will fill with sediment carried down into it by water that washes over its sides. A basin created by faulting forms along normal faults, which usually have a fault plane angle of 60 degrees. These types of faults arise when tensional forces act on brittle rock to stretch or pull it apart. The block of rock above the fault plane (the one that seems to be "resting" on the fault) drops down relative to the block on the other side. 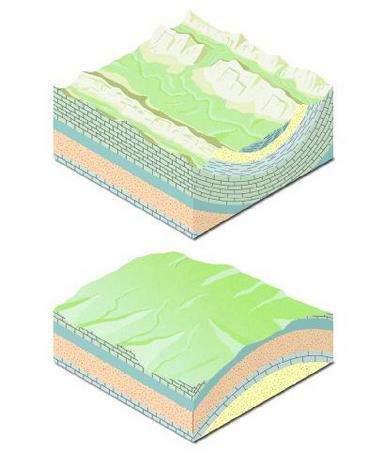 In a landscape, normal faults often occur in series of parallel pairs. Depending on the direction of the fault planes of the faults, the block between a pair of faults will either rise or drop down when movement occurs between the faults. If the fault planes are angled downward away from each other (such as / \), the block between them rises. This uplifted block is called a horst (from the German word meaning high perch). If the fault planes are angled downward toward each other (such as \ /), the block between them drops. This down-dropped block is called a graben (pronounced GRAH-bin; from the German word meaning trench). by water. As the sediment collects, it often does so mainly near the outer edges of the graben. Building up, the sediment softens the angle, giving the newly formed basin its characteristic bowl-like shape. The Great Artesian Basin is one of the largest artesian groundwater basins in the world. (Artesian water is underground water that is confined under pressure. When it is tapped, such as through a well, it flows to the surface without pumping due to this pressure.) The basin covers approximately 670,000 square miles (1,735,300 square kilometers) between the Eastern Highlands and the Western Plateau in east-central Australia. Three large depressions—the Carpentaria Basin, the Eromanga Basin, and the Surat Basin—form the Great Artesian Basin. Some 200 million years ago, tectonic activity raised the edges of these basins. Water subsequently eroded the edges, carrying sand, gravel, clays, and clayey sands into the basins. This sediment was laid down in alternating layers, which measure from 330 to more than 9,840 feet (100 to more than 3,000 meters) thick. The sandy layers are not as dense as the layers formed by the various clays. Water is thus able to flow into the spaces between the sediments forming the sandy layers. This led to the accumulation of the vast groundwater found in the Great Artesian Basin. The saucer-shaped basin is mostly arid. Water from rainfall mainly on the Eastern Highlands soaks through the rock and flows toward the center of the basin. 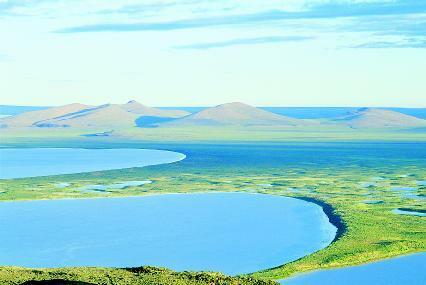 The oldest waters in the basin are over 2 million years old. Thousands of wells tap into the underground water, which ranges in temperature from 86°F to over 212°F (30°C to over 100°C). Because the water has a high salt content, it cannot be used to irrigate farmland. The Great Basin, located mainly in Nevada and Utah, is the northern part of the larger Basin and Range province. Parallel mountain ranges and the valleys between them characterize this province. It is an area that is being pulled apart by tectonic forces. The surface of the Great Basin is broken into blocks, separated by normal faults. The basin is not one basin, but many separated by mountain ranges created by the faults. Both the mountains and the basins tend to be about 25 to 50 miles (40 to 80 kilometers) long and about 15 to 20 miles (24 to 32 kilometers) wide. The Great Basin has drainage unlike other areas in the United States. None of its rivers empty in the sea. One-fifth of the American West, roughly 200,000 square miles (518,000 square kilometers), drains into the Great Basin. Mostly an arid region, the basin features many playas that remain after water has evaporated. Water that does not stand and evaporate in the basin sinks into the ground to become groundwater (water that fills the pore spaces and openings in rocks underneath Earth's surface). In Utah, a large portion of the Great Basin is called the Bonneville Basin. At one time, the area lay beneath ancient Lake Bonneville. In the present day, the Great Salt Lake (one-tenth the size of Bonneville Lake) covers the lowest part of the Bonneville Basin and of the Great Basin. The surface of the Great Salt Lake is about 4,200 feet (1,280 meters) above sea level. Gold was discovered in the Witwatersrand (pronounced VIT-vahturz-rahnd) Basin in South Africa in 1886. Since then, more than 40 percent of all the gold ever mined on Earth has come from the area. The total amount of gold extracted has been valued at U.S. $500 billion. Located between the Vaal River and the city of Johannesburg, the basin covers an area approximately 217 miles (350 kilometers) long by 124 miles (200 kilometers) wide. Scientists believe the basin was originally a lake that began to fill with sediment possibly from mountains to the north and southwest almost 3 billion years ago. Along with sand and silt, the sediment contained gold particles. Today, the gold lies within thin layers of rock, called reefs, that wrap around the edge of the basin and extend to depths of 16,400 feet (5,000 meters) or more. In the center of the basin lies the Vredefort Dome, which is the remnant of the world's oldest and largest preserved meteorite crater. Scientists believe an asteroid slammed into the area some 2 billion years ago. Its impact crater is estimated to have been as large as the basin itself. Death Valley or Death Basin? The hottest place on the North American continent is Death Valley, located in eastern California. Temperatures in the summer exceed 120°F (49°C). Rainfall is scant: no more than 2 inches (5 centimeters) falls per year. Death Valley also contains the lowest point in the Western Hemisphere, Badwater, a salty pool whose surface is 282 feet (86 meters) below sea level. Nearly 550 square miles (1,425 kilometers) of the entire area lie below sea level. But Death Valley is not a valley. Technically, it is a desert basin, part of the Basin and Range province. It is a 156-mile-long (251-kilometer-long) trough that lies near the Nevada border between two fault-block mountain ranges: the Panamint Mountains on the west and the Amargosa Range on the east. The deep Death Valley basin is filled with sediment eroded from the surrounding mountains. Most of the little water that drains into Death Valley quickly evaporates, leaving playas. What water remains forms salt ponds and marshes. Despite the harsh environmental conditions in Death Valley, plant and animal species thrive there. Many of these are found nowhere else on the planet. McPhee, John. Basin and Range. New York: Farrar, Strauss, and Giroux, 1981. Trimble, Stephen. The Sagebrush Ocean: A Natural History of the Great Basin. Reno, NV: University of Nevada Press, 1999. "Explore the Geological Wonders of South Africa—Visit the Geology of the Witwatersrand." Geological Heritage Tours. http://www.geosites.co.za/witsgeology.htm (accessed on August 14, 2003). Geology of Great Basin National Park. http://www.aqd.nps.gov/grd/parks/grba/ (accessed on August 14, 2003). "The Great Artesian Basin Information Site." The State of Queensland Department of Natural Resources and Mines. http://www.nrm.qld.gov.au/water/gab/ (accessed on August 14, 2003). Plate Tectonics. http://www.platetectonics.com/ (accessed on August 14, 2003). Thank you so much for this contribution. I was looking for simple interesting descriptions of landforms. This is clearer than any textbook (including a 5th grade one) that I have read. wonderful presentation but would i like more inforemation on the impact of change in landforms.